Long term memory loss, or amnesia, is the inability to remember new information or remember past events, people, or information. The type of information the person is unable to remember depends on what part of the brain that is not functioning correctly, therefore causing the memory loss. The onset of long term memory loss can be either sudden, as is the case when the amnesia is caused by trauma to the brain, or gradual, as in dementia or Alzheimer's disease. The effect of amnesia on the daily life of the individual depends on what type of information the person is unable to remember. The person who experiences long term memory loss has various treatment options to learn to cope with the effects of amnesia. Dissociation induced by a traumatic event. Long term loss of memory appears related to injury or a disease process in the hippocampus, the neocortex, or the nerves connecting these two areas of the brain. The combination of the cause of the damage, the extent of damage and location provides clues to the type of treatment and rehabilitation that will be effective in minimizing the effects of amnesia on daily living. 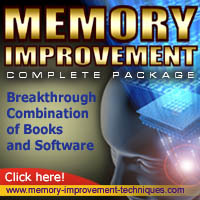 While it is not possible to retrieve fully the memories lost due to amnesia, it is possible to minimize the effects of amnesia on daily living. Most experts recommend orienting the person to their surrounding several times a day. This process involves repeatedly giving the person names of people and objects in their surrounding as well as "showing and telling" them where things are in the room as well as providing directions on note cards. Other strategies include showing the person pictures of special people, such as relative and friends, and telling stories about experiences of the patient with the person. These strategies potentially can "re-wire" the brain to form new connections in order to create new memories. Occupational therapists are professionals who can assist the patient and their loved ones develop specific strategies to assist the person dealing with long term loss of memory.